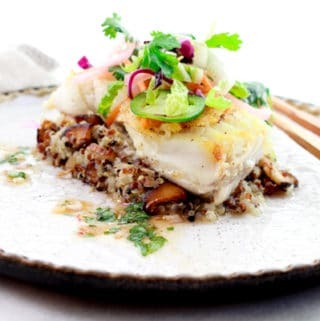 Last Updated: April 17, 2019 · Published: May 21, 2018 By: Asian Caucasian 2 Comments This post may contain affiliate links or sponsored content. I’m obsessed with TOFU! Seriously! So I wanted to come up with something new to add to my recipe repertoire! There’s only so much stir-fry tofu you can eat, am I right? 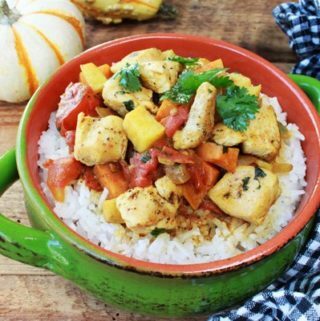 Get ready kids —> here’s a real tofu recipe winner!! Even you tofu-deniers will love this one, promise! 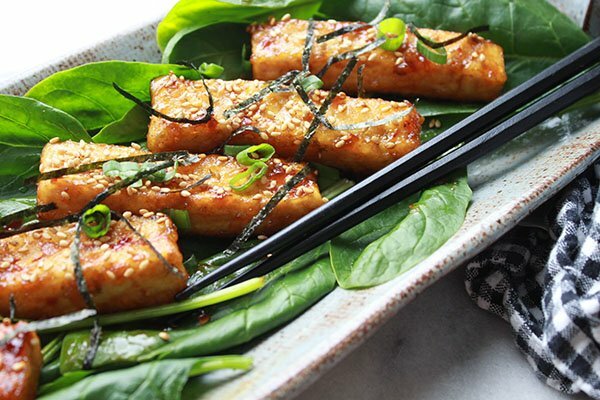 These Gluten-Free Sesame Seared Tofu Strips will make you do your food happy dance. For realz! Make sure to use extra firm tofu for this recipe so the tofu doesn’t fall apart. They will crisp up nicely with the cornstarch coating (low fat too!). So what about the sauce? That’s the flavor bomb here, sweet and spicy and so memorable! Gluten-free soy sauce (or you can use low-sodium soy if you’re not gluten-free), rice vinegar, sesame oil, sambal oelek (for the kick), honey (to mellow it out), lime zest, garlic, and ginger. BAM! Thicken the sauce with a little cornstarch/water combo. I wanted to make it super pretty for the presentation, so I set the tofu on a bed of fresh spinach leaves and garnished it with more toasted sesame seeds, green onions, and organic nori strips (very thin strips of seaweed). This dish is perfect as a starter, or make it a main course. 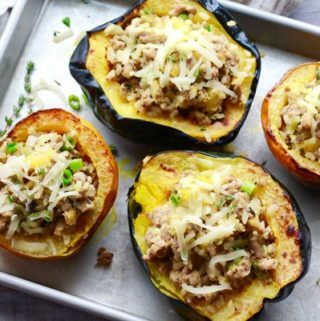 Either way, you’ll want to keep this recipe around for awhile! Gorgeous, golden brown tofu strips are begging to be eaten! These Gluten-Free Sesame Seared Tofu Strips are so full of flavor from the easy, sweet and spicy sauce. Garnish the tofu with some green onions, toasted sesame seeds, and organic nori strips. So pretty! You can purchase extra firm tofu at just about any grocery store. I get mine at Trader Joe’s because I like the consistency of their tofu. And it’s always in stock! 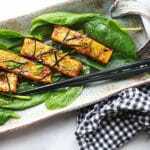 For this recipe, cut the tofu into even strips as shown above. 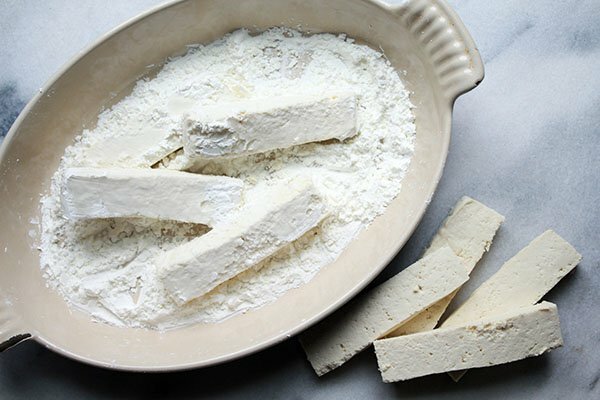 Dredge the extra firm tofu in plain cornstarch. No need to add salt and pepper to the dredge because the flavoring will be in the sauce. 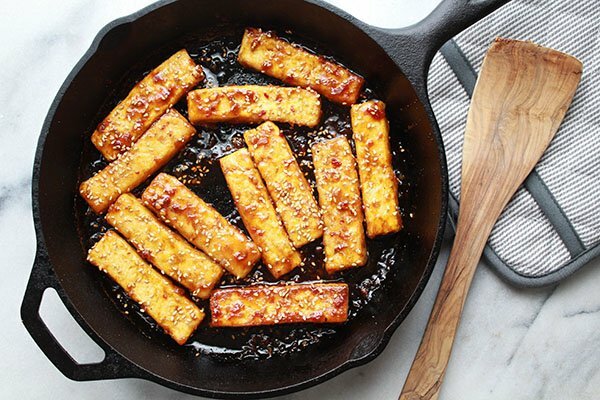 Fry up the tofu in a heavy cast iron or heavy skillet using just two tablespoons of canola oil. Cook on all sides to get a beautiful golden brown crust. Remove the tofu from the pan and place on paper towels to soak up the extra oil. Don’t get freaked out by all of these ingredients. 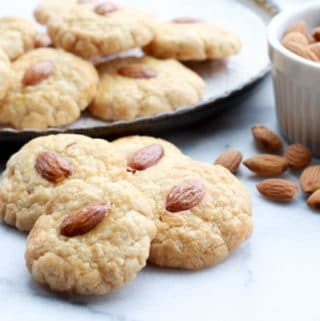 Once you have them in your pantry you can use these in so many recipes! 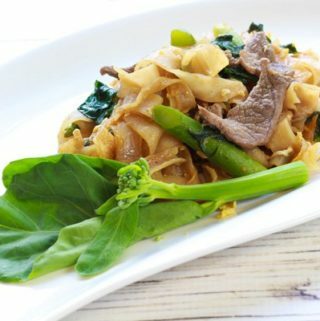 (See this link for Asian cooking essentials.) 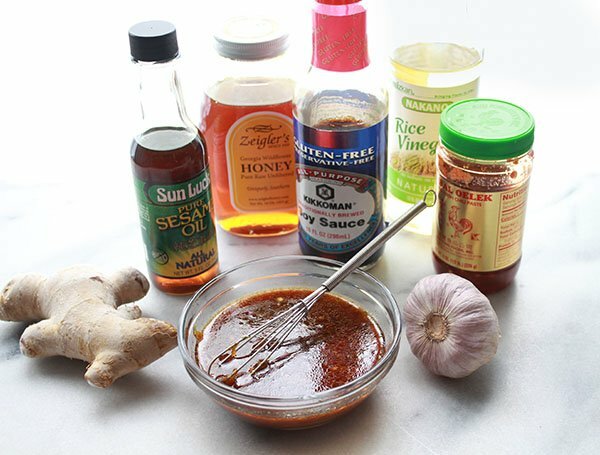 These are the staples for most good Asian sauces and dips. This sweet & spicy sauce for the tofu is the flavor bomb in this recipe! Take a look at that gorgeous color with the sauce! Perfection every time. 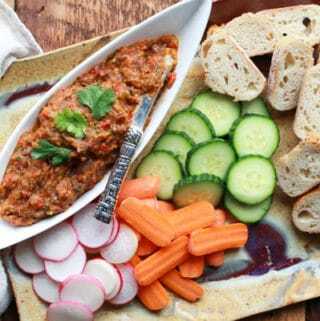 This sweet and spicy sauce will truly rock your world! 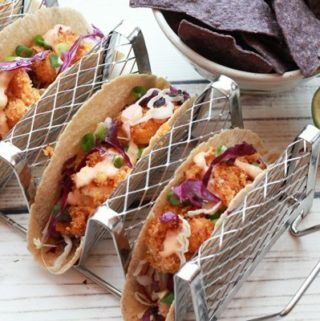 Using a heavy cast iron skillet for this recipe is ideal. It helps with the browning and heat distribution (unless you have a stove top with uneven heat). I like to use my cast iron as much as possible! Almost too pretty to eat, right? Don’t let that stop you! 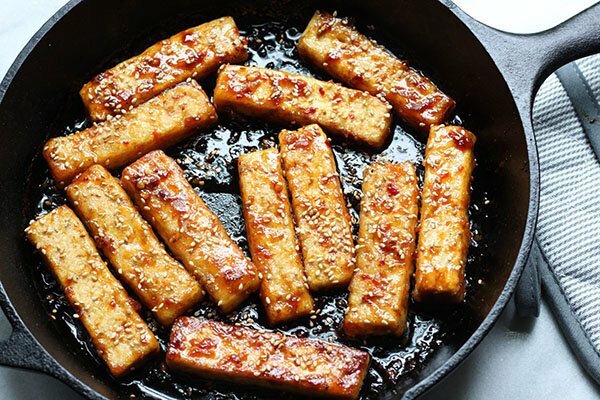 You’ll want to make these Sesame Seared Tofu Strips again and again. These Crispy GF Sesame Seared Tofu Strips are so full of flavor from the easy, sweet and spicy sauce to the crispy exterior. Drain the tofu blocks and tightly wrap with paper towels or a kitchen towel to remove excess liquid. Let sit for at least 30 minutes. 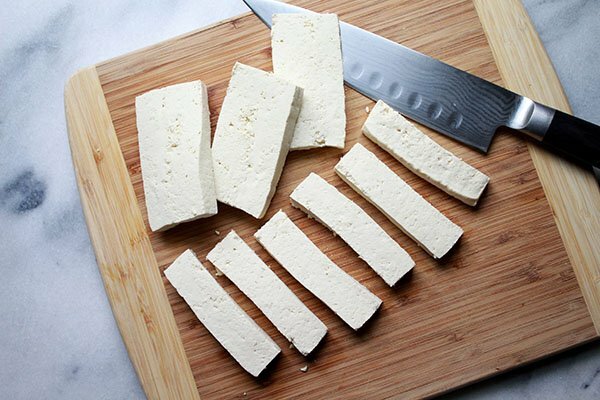 Place on a cutting board and slice the tofu into ¾-inch thick strips. Place the cornstarch into a shallow dish (like a pie pan) Dredge the tofu strips into the cornstarch on all sides. Set aside on a plate. 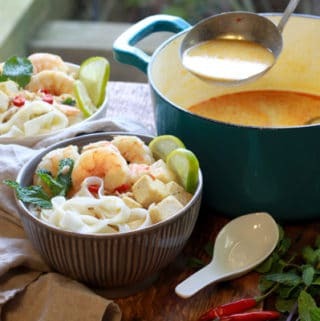 Prepare the sauce: In a small mixing bowl, whisk together the soy sauce, rice vinegar, sesame oil, lime zest, sambal oelek, honey, ginger, and garlic. 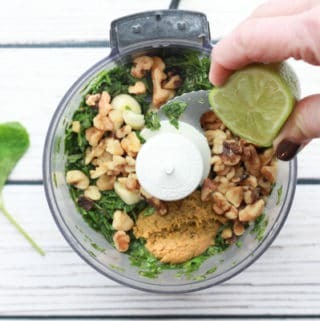 In a small prep bowl, whisk together the 1 tablespoon cornstarch and warm water until thoroughly combined with no lumps. Heat a large cast iron skillet over medium heat with the canola oil, brush or tilt the pan to coat evenly. 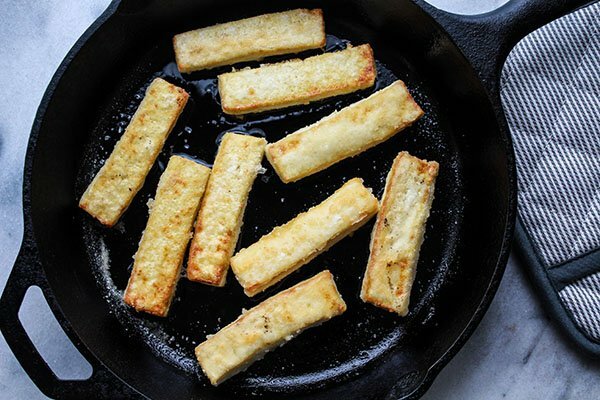 Add the tofu strips to the pan and fry for about 3 minutes on each side, or until tofu is nicely golden brown and crispy. Remove the tofu from the pan and place on paper towels to blot the oil. Keeping the pan on low to medium heat, add the sauce and cornstarch mixture to the pan. Stir until the sauce begins to bubble and thicken, about 2 minutes. Turn off the heat and add the tofu strips back into the pan and thoroughly coat with the sauce mixture. Sprinkle with the toasted sesame seeds, tossing briefly. 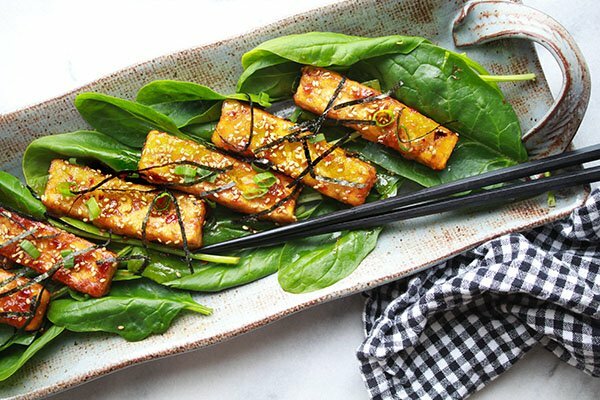 Serve the tofu over a bed of spinach or other greens and garnish with the green onions, more sprinkles of sesame seeds, and nori strips. This dish can be served as an appetizer for 4-5 people, or an entrée for 3-4 people. You can substitute the tofu for tempeh. Make sure to use extra firm tofu for this recipe so the tofu doesn’t fall apart. They will crisp up nicely with the cornstarch coating (low fat too!). You can purchase extra firm tofu at just about any grocery store. I get the sprouted tofu at Trader Joe’s because I like the consistency of their tofu. And it’s always in stock! These look GREAT. 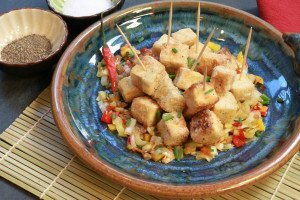 What a flavorful way to serve up tofu. Extra sambal oelek for me, please! Thanks! Couldn’t agree more! The hotter the better!